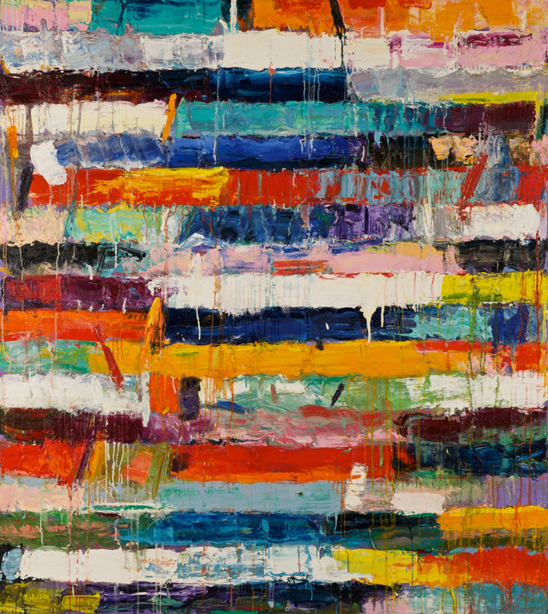 Monroe Hodder is the star attraction at William Havu Gallery. Her thick, impasto, expressive, abstract paintings fill the front gallery with vivid, shocking color in a show appropriately title “Painting Metabolism!” If I had a metabolism like that I’d be as thin as a Ralph Lauren model. Perhaps all the frenetic energy and screaming color of Hodder makes the small new works by Debra Salopek tucked in a corner near the desk and the back alcove space of the gallery even more inviting. Salopek has ten works on display all relatively small oil on paper abstracted landscapes that are soft, lush and invite silence to envelope the viewer. Four small conte crayon on paper drawings are like tiny little etchings, each mark exquisite and intentional. 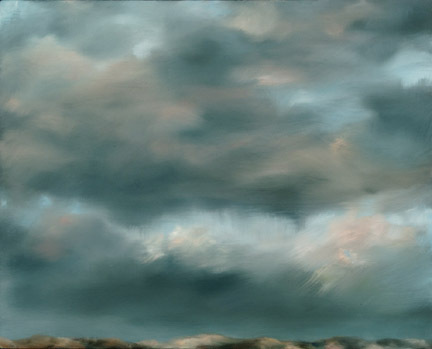 Her paintings and drawings focus primarily on the skies and the clouds and her technique with oil is ethereal like watercolor but with more intense hues and pigments. Salopek’s touch is delicate, proving that a whisper is often more effective than a bullhorn. “Borrowing Time” is an exhibition of 54 paintings by Denver artist Stephen Batura on display at Robischon Gallery through October 31. Batura based each of these paintings on the historic photographs of Charles Lillybridge from the online database of the Colorado Historical Society. Lillybridge photographed everything, from people to buildings to wagons to trains. His photographs are often flat and blurry and this is a quality that allows Batura freedom to explore his atmospheric painting approach to translate and transform Lillybridge’s imagery into something more than a documentary. The images displayed salon style play off one another to tell a story of not only the past, but the present and the future as well. Batura utilizes a subtle monochromatic palette that is jarring and otherwordly. He adds gold and silver leaf to some paintings—gold for the historic Colorado gold rush and silver used in processing film. In a painting like “Reflection” the effect is a hyper realistic reflection on water that is equally spectral and off-kilter. Can urban ideals exist in the rural lifestyle? Can rural values exist in an urban society? These seem to be the questions Andrea Modica raises in her photographic series “Fountain, Colorado” on display through January 17 at the Boulder Museum of Contemporary Art. Modica does more than document the lives of the Baker Family who run a slaughterhouse in Fountain, a town of 15,000 located between Fort Carson military base and Colorado Springs. She captures an almost otherworldly tenderness among this family. Her silvery platinum/palladium images made with an 8×10 camera are remarkably detailed. Their subject matter is alternately tender and grotesque: A lamb fetus held in a human hand; a child falling asleep on a table; a sister holding her hands over her brother’s eyes. 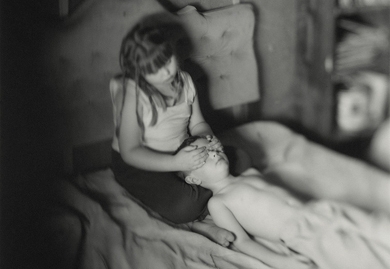 Modica’s imagery is reminiscent of Manual Alvarez Bravo, but with the eye of Sally Mann. These are more than images documenting a lifestyle and more than portraits of a family. There is something primal in these photographs that is equal parts confrontational and disturbing. They are raw. They are intimate. And in the end, they are beautifully made.